DUBUQUE, Iowa – The No. 9-ranked Gustavus volleyball team started the Loras Invitational with a pair of wins Friday. The Gusties dropped only the second frame against Dominican and rallied to win in four sets, followed by a shutout victory over Dubuque, improving to 5-1 overall. With 20 kills on the day, Lauren Hanson (Sr., Redwood Falls, Minn.) became the 14th member of Gustavus’s 1,000-kill club. After trailing 6-1 in the first set, Gustavus responded with eight unanswered points and never let go of the lead for a 25-19 win. The second set started similar with a 7-2 Stars advantage, but this time the Gusties were not able overcome the deficit. They did score eight-straight points to cut the lead to one, but Dominican kept the Gusties at bay and claimed a 25-23 win. After a back-and-fourth start to the third frame, the Gusties went on an 8-2 run midway through and finished with a 25-21 win. A tightly-contested fourth set resulted in the scoring difference to not exceed four points in the waning moments of the match before the Gusties closed out a deciding 25-23 victory. 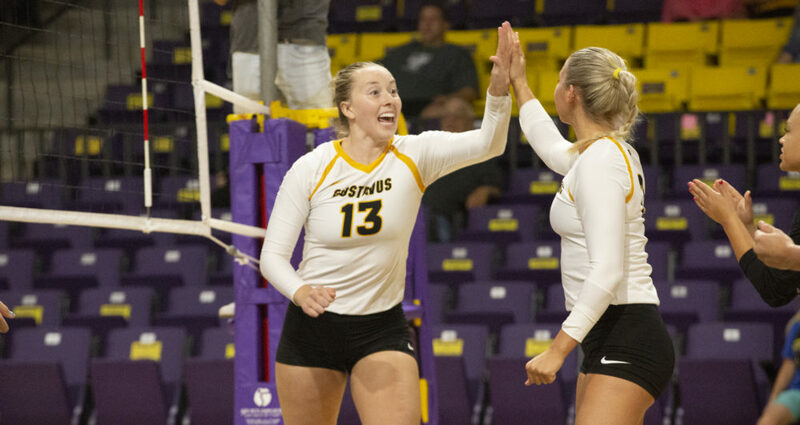 Four Gusties reached double figure kills, led by Kate Holtan’s (So., Rochester, Minn.) 12. Nora Holtan (Sr., Rochester, Minn.) recorded her seventh career triple-double with 11 kills, 43 assists, and 14 digs. Hanson and Hanna Albers (Sr., St. Louis, Mo.) each posted 10 kills. Brittany Luethmers (Sr., Prior Lake, Minn.) led the defense with 26 digs. Gustavus finished day one at the Loras Invite with relative ease, winning straight sets 25-15, 25-20, 25-19. The Gusties trailed for only two volleys in the entire match. Hanson paced the attack with 10 kills for the second-straight match. Nora Holtan finished with 32 assists and 11 digs. Luethmers and Kate Holtan led the back line with 20 digs apiece – a career-high for Holtan. The Gusties close out the Loras Invite tomorrow at 9 and 11 a.m. against Northwestern-St. Paul and Loras, respectively.